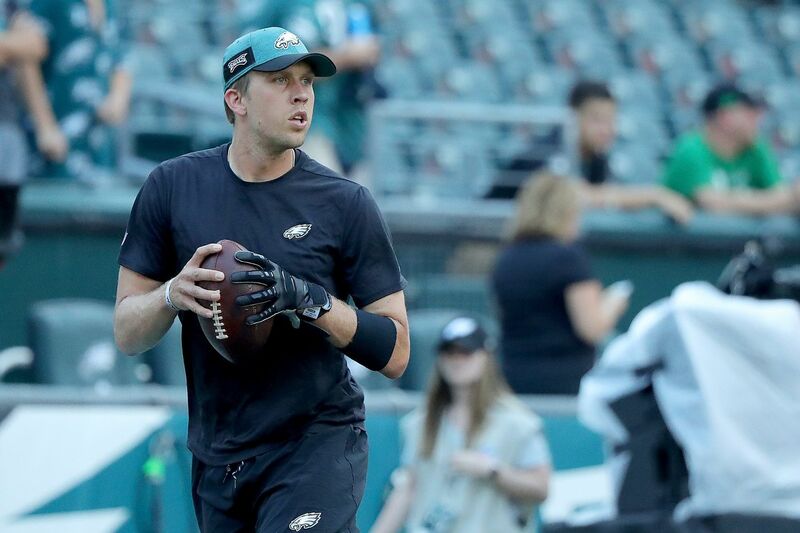 Nick Foles warms up ahead of Thursday's season opener. The Eagles will open the 2018 NFL regular season by hosting the Atlanta Falcons at 8:20 p.m. Thursday at Lincoln Financial Field. What will happen? Who knows? But that doesn't stop our four beat writers from trying to predict the outcome. You have to go with what your eyes tell you. I see an Eagles team that couldn't get all of its top players on the field during training camp or the preseason, a team that I think will contend for another championship, but does not seem ready to come out firing Thursday night. I have been wrong before, yes. I don't like the fact that Atlanta likes to run the ball, and Nigel Bradham is suspended this week. I don't like Nick Foles not having Alshon Jeffery. And I think all the pregame revelry – which is absolutely wondrous and essential, for a franchise that finally won its first Super Bowl – is going to be an odd way to kick off the process of focusing on this year. Putting the Super Bowl behind has been Doug Pederson's message since the spring, and it is why Malcolm Jenkins wanted the Super Bowl LII locker room sign taken down. Malcolm's gonna want to avert his eyes Thursday night. Prediction: Falcons 18, Eagles 16. I always thought this game was going to be difficult for the Eagles, even if Carson Wentz was ready. Underestimate Nick Foles at your own peril – I've done it before – but the opener will be a tough assignment for the rhythm quarterback. I don't put much stock in the preseason as far as the offensive struggles, but several players didn't even take a snap. There will likely be some rust, especially for Jason Peters and Darren Sproles, who haven't played since last October and September, respectively. The absence of Alshon Jeffery will hurt, especially with Mack Hollins also out. The Eagles have personnel groupings to account for the missing receivers, particularly two tight-end sets. But it may be asking a lot of rookie Dallas Goedert. Getting Jay Ajayi going on the ground will be important. He's been dealing with a foot issue. The Eagles defense doesn't have as many questions coming on, but Nigel Bradham's one-game suspension will impact a linebacker corp that will see more snaps than usual. The Falcons employ a fullback and utilize multiple tight end groupings. Jordan Hicks is back in the middle, but Kamu Grugier-Hill and Nate Gerry will be seeing their first significant NFL action on defense. Jim Schwartz has had the Falcons' number in the last two meetings, but you can hold Matt Ryan, Julio Jones and company down for only so long. Prediction: Falcons 23, Eagles 20​. The Eagles can beat the Falcons with Nick Foles at quarterback. They proved that last January in the playoffs. What I'm not sure of is whether they can beat them without Alshon Jeffery and Nigel Bradham. Jeffery still is recovering from rotator cuff surgery and won't play. Neither will Bradham, who is serving a one-game suspension. Bradham is the defense's enforcer and a vital element of their success against the run. Jeffery played a major role in the Eagles' playoff win over the Falcons. Had four catches for 61 yards, and all four were big. His 21-yard, third-and-8 catch at the end of the first half put the Eagles in range for a 53-yard Jake Elliott field goal. His 15-, 13- and 12-yard grabs on a 12-play, 74-yard third-quarter drive set up another Elliott field goal and put the Eagles ahead for good. Can they beat the Falcons without Bradham and Jeffery? Sure. Will they? We'll see. Prediction: Falcons 16, Eagles 13. It's hard picking against the Eagles at home, where they've been 15-3 during the last two seasons. It's especially tough picking against them on Thursday night, when there will be an electric crowd celebrating the Super Bowl champions. But this is going to be a tough game for the Eagles without Alshon Jeffery and Nigel Bradham – not to mention Carson Wentz. The Falcons only scored 10 points in Philly back in January. If the defense plays at that level again, the Eagles will win. But they'll sure miss Bradham. The Eagles had the NFL's top-ranked rush defense last season and they limited Falcons running back to Devonta Freeman to seven yards in the playoff game last year, but that will be tougher to do with Bradham suspended. On offense, I wouldn't be worried about Nick Foles after the preseason. There should be confidence in him. But without the threat of Jeffery on the outside, the passing game must change. Look for the Eagles to play more two-tight end sets. I think the key is establishing the run early, like they did in the playoffs last year. That helped Foles in the second half. Ultimately, I think the absences and early-season rust make this a tougher game than it would be if the Eagles played it later in the season. The Eagles shouldn't start playing the "nobody-believes-in-us" card; the record will impress at the end of the season and they'll be in Super Bowl contention. It just won't look as good on Friday morning. Prediction: Falcons 19, Eagles 17.